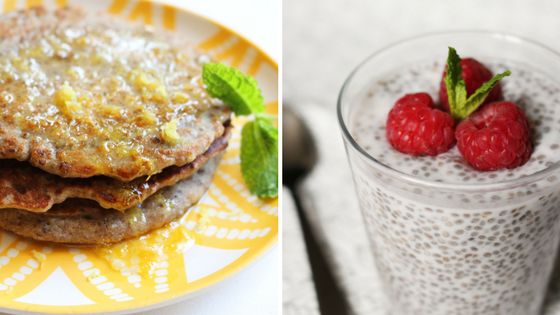 2 Chia Seed Recipes that you’ll come back to time and time again. The humble chia seed may not look like much, but those little black and white balls definitely pack a punch. And you’ve probably got a packet lurking somewhere in the back of your cupboard. Undoubtedly, you bought them after reading or hearing that they’re the next superfood. Yet they’ve not made it into many meals (if any). Perhaps that trend can change as these two recipes will have you reaching for that packet on a regular basis. But before we get stuck into this week’s recipes, let’s take a quick look at the benefits of Chia Seeds. If your main goal is losing weight and body fat it can sometimes be difficult to get enough fibre in your diet on restricted calories. This isn’t uncommon and you’ll be please to know that a portion of chia seeds can really help. Because around 81% of the carbs in a chia seed is fibre, making them a great source for that all important roughage. So a 25g serving of chia seeds will give you around 9-10g of the recommended 30g of fibre per day. Not only does a chia seed pack a punch in terms of fibre, it also can help you with those feelings of hunger. And I’m sure that’s music to the ears of those of you struggling with rumbling stomachs all day long. Amazingly, chia seeds can absorb up to 10 times their weight in water. Consequently, this combined with the high fibre content will help you feel fuller for longer. And this is why I would recommend soaking them prior to using them in recipes. So chia seeds are packed with fibre and help you feel full for longer, but they don’t stop there. On top of all that they are a source of Omega 3 fats. But before we get too excited at this point, it’s worth bearing in mind that the fats are in the form of AHA (Alpha Linolenic Acid), which the body is relatively poor in converting to DHA (docosahexaenoic acid), which is the body’s preferred type. So you’re best sources of Omega 3 are still animal based, ie fish oil. However, if you can’t get your Omega 3 from these sources, chia seeds can be a good option. Firstly, in a small cup combine 2 tablespoons of chia seeds with 4 tablespoons of water and leave in the fridge for about 20 mins. Zest the whole lemon and set aside half for the topping. Next, mash the banana in a bowl and add in the chia seeds, flour, milk, cardamom, vanilla, half the lemon zest and 1 tsp. honey. Then whisk everything well until a thick batter has formed. Heat some of the coconut oil in a non-stick pan then pour the batter forming small pancakes (about ¼ cup per pancake). Fry until bubbles appear on the surface and then flip and cook for another minute. Then repeat with the rest of the batter adding more coconut oil when required. You should be able to make about 6 small pancakes. Lastly, combine 3 tsp. of honey and the rest of the lemon zest to make the drizzle. Firstly, place the chia seeds, maple syrup and the coconut yoghurt in a jar or bowl and pour in the milk. Then stir everything together, cover and place in the fridge. Store in the fridge overnight (or approx. 6-8 hours). Once the pudding reaches a jelly like texture, divide between 2 dishes and serve with fresh raspberries. So there you have it, dust off that chia seed packet from the cupboard and start experimenting with these recipes. I guarantee you’ll love them and you won’t have any problems working your way through the rest of the packet. Great recipes are one thing, but is your nutrition plan set up to bring you results? Before your finger clicks to navigate to a new webpage, just spend 30 seconds asking yourself the following 5 questions. Because if you can answer ‘YES’ to any of them, then I’ve got the solution that can help you. And best of all, it’s absolutely free. Has your fat loss stalled or completely non-existant? Are you stuck in meal plan hell eating foods you hate? Do you feel demotivated and fed up with the whole process? Does your goal feel like an impossibility? Are you confused by terms like macros, flexible dieting, refeed days, and the like? So how would you like to discover a simple and effective method of setting up a nutrition plan the right way? All you need to do is click the image below and register for my free ‘7 Steps to Get Lean’ Online Nutrition Workshop. Then, once you’re registered, make a note of the date and time in your calendar, because you won’t want to miss this. Not only will you learn all about calories and macros, but you’ll be discovering the exact approach I use for both my own and my client’s programmes. It’s the game changer you need to get in the best shape of your life.